I think MMW Food is meant for 2 main group of people, the locals looking for good food, and of course the foreign tourist looking for something local, something truly Malaysian. We provide a Top 50 ranking of Malaysian Food, based on how often they are offered by local eateries. Taking the top position is our everyday staple food such as Fried Rice, Nasi Lemak and Chicken Rice. Nevertheless, how could we forget local delicacies such as Bak Kut Teh, Laksa, Roti Canai, Fried Kuey Teow and Teh Tarik. 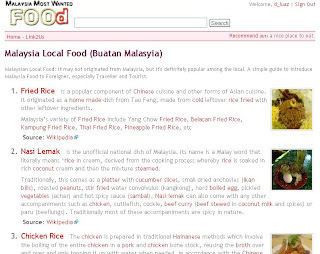 Thanks to Wikipedia, we are able to offer a short description of the Malaysian Food. Though not all of them originated from Malaysia, but it is definitely popular among Malaysian.